Should Central Asia Be Worried About Russia’s Fallout? Any crisis in Russia has potential political repercussions throughout Central Asia. Since annexing Crimea, Russia’s strategy appears to be unraveling, with a growing economic crisis and continuing confrontation with the West over Ukraine. The results have been severe: plunging oil prices, a plunging ruble, Western sanctions, and military conflict. Moscow is also facing the prospect of domestic unrest, a glimpse of which was observed at the end of December. This has implications for the Central Asian republics, which have found themselves perplexed by the crisis in Ukraine. With Russia’s problems mounting, Central Asian states would be wide to be proactive in their contingency planning. Any scenario involving political upheaval in Russia would have implications for Central Asia’s former republics in general, and Kazakhstan in particular. That may explain why Kazakhstan has been busy with diplomatic efforts to facilitate a multi-party dialog in Ukraine. Whether Kazakh President Nursultan Nazarbayev really has a chance to jump start a peace process is of course debatable. Russia has already frustrated one friend – Germany’s Angela Merkel – and getting the Kremlin to withdraw from Ukraine does not look likely. 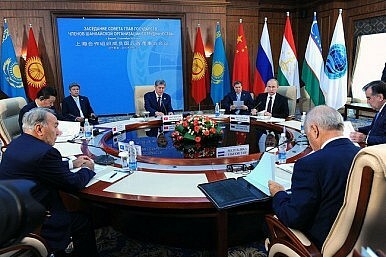 Still, Kazakhstan is a member of the Russia-led Eurasian Economic Union with a unique status within the framework of Moscow’s integration project. Combined with a positive attitude toward multilateral engagement with the international community and the steps it has taken to integrate its economy with the global markets, policymakers in the West and East could well benefit from Kazakhstan experience and knowledge of post-Soviet politics. Turbulence in Russia could also have dire implications for Kyrgyzstan and Tajikistan, the economically weakest states in Central Asia due to the unresolved intra-regional divide in the Ferghana Valley. Both countries are prone to domestic instability. The global community has already had a taste of the impact of state collapse in Central Asia, when Ferghana Valley became a regional humanitarian disaster in the summer of 2010 after a massive outbreak of the ethnic violence in South Kyrgyzstan. Turkmenistan, Uzbekistan and Kazakhstan are in a somewhat stronger position, with a more centralized power structure. While Turkmenistan is neutral on the regional subdivide, Kazakhstan and Uzbekistan have the potential to play a positive role in regional stability. Before they can do that, though, the region must resolve longstanding inter-state disputes in the Ferghana Valley triangle. Regional observers do not expect Uzbekistan to overcome its distrust of Kyrgyzstan any time soon, nor to find a way to compromise with Tajikistan. A weaker Russian presence in Central Asian could have additional repercussions for Kyrgyzstan, which has become something of a Russian client-state over the years. Destructive factional rivalries in Kyrgyz politics have been a major contributing factor to the country’s misfortunes over the last decade. While the local political elite has the support of the Kremlin, they lack credibility in the eyes of Kazakh and Uzbek policymakers. These complexities again contain the seeds of regional instability. Undeniably, the fallout from the Ukraine crisis has been felt in Central Asian. Moreover, Russia’s Eurasian Economic Union has come into force at the worst possible time for Moscow. Kazakhstan and Belarus are explicitly unhappy with Vladimir Putin’s recklessness in Ukraine and the unintended consequences of Moscow’s irredentism for Russia’s allies in the course of 2014 have led to an exchange of critical statements by the heads of EEU member states. Highly dependent on migrant remittances from Russia, Central Asia’s economies are experiencing spasms and a blowback effect from the ruble devaluation. As the challenges mount, it may be time for the region to put aside its differences and lay the foundation for inter-state cooperation. Russia is not the only economy affected by the post-Crimea sanctions.